"Jo and Lee, I'm so sorry for your loss. I'm glad I had the..."
"Dear Jo Lynne, Lee Anne, Taylor and Chandler, We are sorry..."
"I will miss your smiling face and our talks. Thank you for..."
Edna Elizabeth Harrell Jordan Whatley, beloved wife, mother, grandmother and aunt, died peacefully at her home on Monday, September 10, 2018. She was five days shy of her 98th birthday. Born in Rayville, Louisiana in 1920, she spent her early years in Bastrop, Louisiana. She moved to Baton Rouge in 1959 to work for Gulley & Poor Realtors. She then worked for 25 years within the Mortgage Loan Department at American Bank, retiring as Senior Mortgage Loan Officer. She was a volunteer at the Baton Rouge General Hospital and a member of Jefferson Baptist Church. 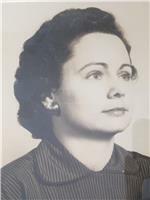 Preceded in death by her mother, Sarah Elizabeth Dotson Harrell, father William Frank Harrell, her daughter Myrna Clell Jordan Atwood Sedita, husband Winfred Clell Jordan, husband Erroll Reneth Whatley, and brothers James Chester Harrell, Oliver Benford Harrell, Ralph Lewis "Pete" Harrell, and Billy Keith Harrell. Mrs. Whatley is survived by her granddaughters Lee Anne Atwood Kean and husband Breck Kean of Baton Rouge, Jo Lynne Sedita George and husband Paul George of Lafayette, and her grandson John Bourland and wife Jennifer Bourland of San Clemente, California. She is also survived by great grandchildren Taylor George Wilkinson and husband Kyle Wilkinson, Chandler George, Lauren Bourland and Trenton Kean. She was the beloved matriarch and "Aunt Edna" to numerous nieces and nephews. Visiting will be at Rabenhorst Funeral Home, 825 Government Street, Thursday, September 13, 2018 from 10:00 am until services at 1:00 pm conducted by her Pastor, Dr. David Goza of Jefferson Baptist Church. Pallbearers shall be Bill Harrell, Ken Harrell, Greg Harrell, Brad Harrell, Chandler George, Kyle Wilkinson, Breck Kean, and Paul George. Interment will be in Roselawn Memorial Park.